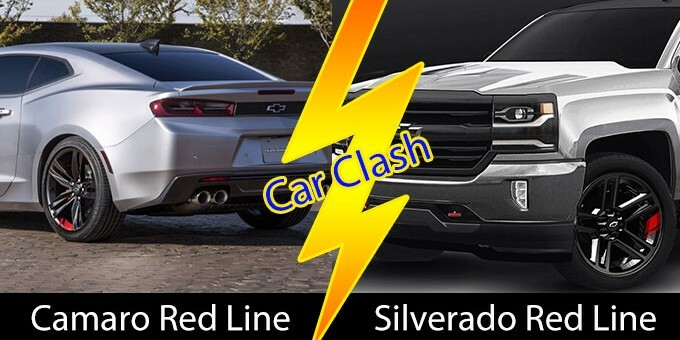 Chevrolet is bringing a boatload of accessories and concepts to the 2015 SEMA Show in Las Vegas, and we felt it was time for another round of Car Clash with two of the stars for the bowtie brand. In one corner, we have the 2016 Chevrolet Camaro Red Line concept, which the brand says demonstrates “the lifestyle and personalization possibilities of the brand’s latest vehicles” with a stylish aesthetic. And the 2016 Camaro will have plenty of accessories to be boot. Wearing an “Enhanced Silver Metallic” exterior color and complimented by a charcoal roof and Satin Graphite and red accents, it’s a downright looker. Twenty-inch wheels finished in, you guessed it, Satin Graphite with red accents and red fog lamp bezels round out the exterior design of the concept. But, how does Chevrolet’s full-size pickup wear the same style? The 2016 Chevrolet Silverado Red Line concept takes each of the design cues listed above, but applies them to the truck’s recently refreshed design. The look is applied a tad differently on the 2016 Silverado, however. Satin Graphite mirror caps, window moldings, grille surround and inserts, door handles and fog lamp bezels create the contrast needed with the same “Enhanced Silver Metallic” hue found on each Red Line concept. Red tow hooks, black bowties and a black-chrome exhaust tip give the Silverado Red Line a much different feel than the Camaro Red Line. Which wins this battle? The 2016 Camaro Red Line. In fact, the Silverado Red Line is actually our least favorite of the Red Line bunch. The Camaro Red Line wears all its accessories and personalization factors much better in our eyes. But, it’s your turn to speak up. Vote in the poll below on which vehicle wears the Red Line design better.